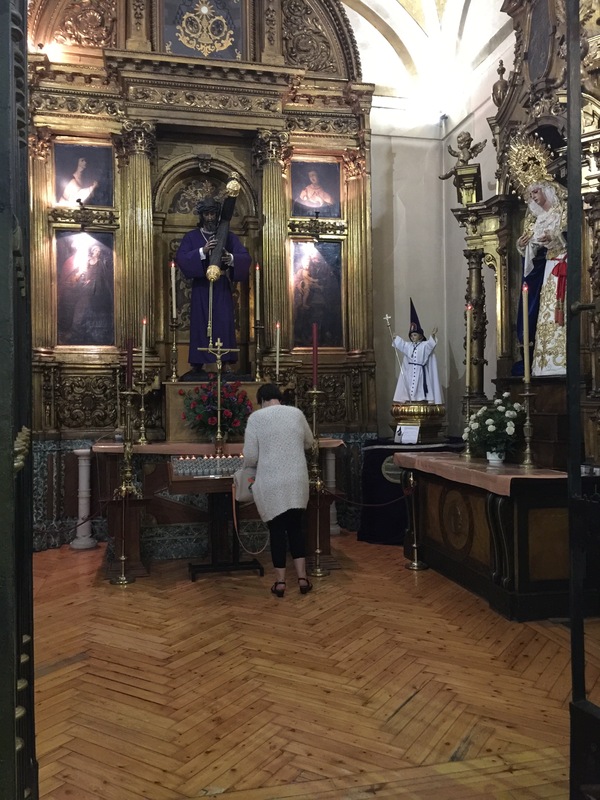 You might expect me to be in the Madrid Cathedral on a major feast day like Corpus Christi, but I’m not. 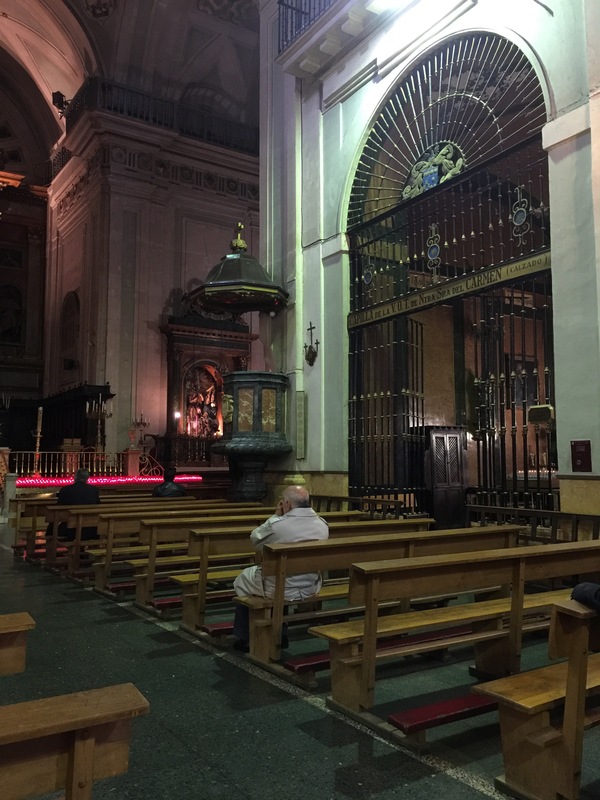 I have a particular fondness for this smaller church: Nuestra Señora del Carmen near the Puerta del Sol. It’s a local church. 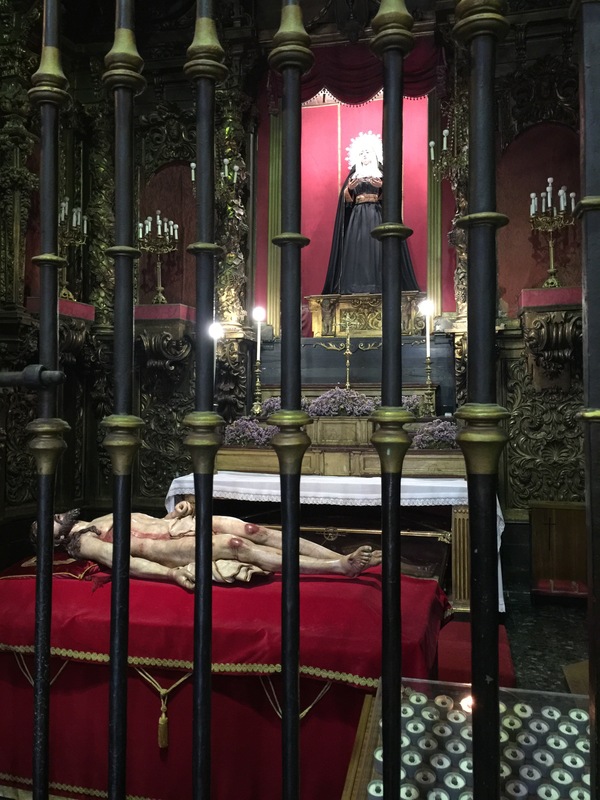 Gets a few tourists, but for the most part, it is a local Madrid parish. I always start by buying a candle. 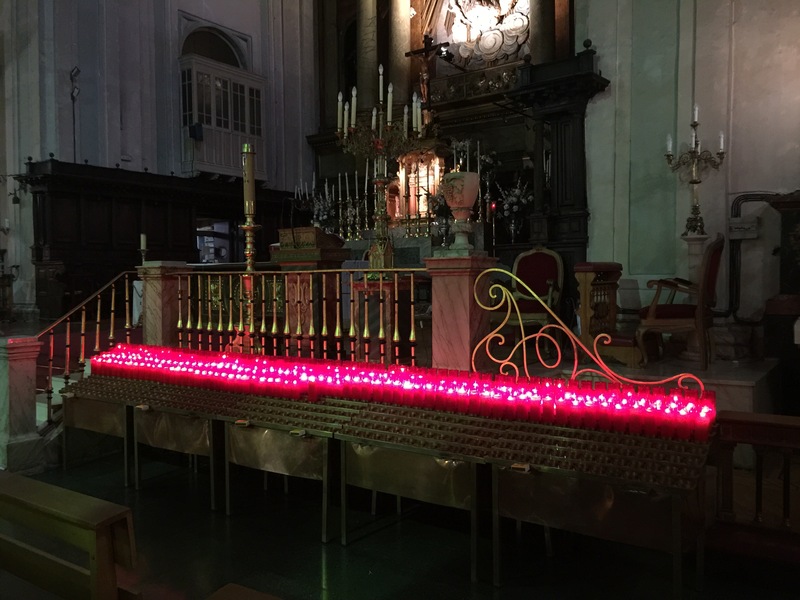 Tall red candles are dispensed for 2€ from a red machine located in the corridor that runs alongside the left side of the chancel. It looks more like a Coke vending machine than anything else. There are boxes of matches near the display of candles. The side chapels have little blinking electric lights that stand in for real candles. You drop in a coin and all the lights blink, then settle down with one more lit. I’ve done it, but it’s not satisfying. 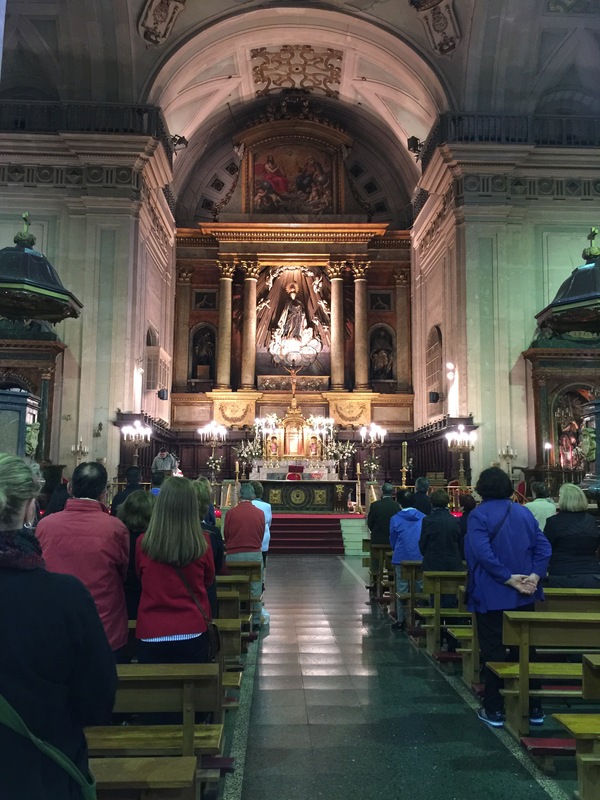 Slowly, the parishioners file in, make the rounds of their favorite chapels and take a seat. One man in a leather jacket left a bouquet on one side altar. An older woman reached to stroke the feet of a state in another. And a couple volunteered to do the readings. Each personal gesture, each individual, reverent protocol adds to the experience. 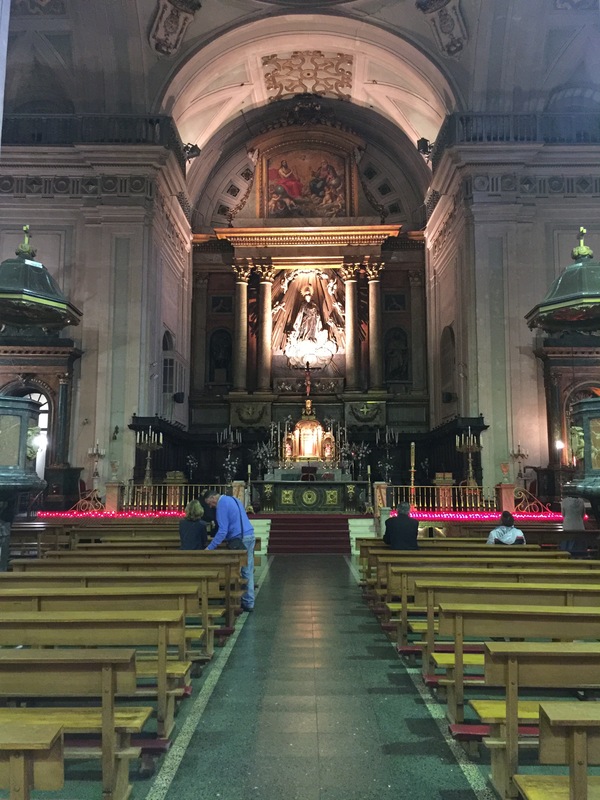 Mass begins and that lone man – the one with the tan topcoat, the pink shirt, the shined shoes, and the pink tie – stands and walks out the door. It’s as if that few moments in this sacred space were all that he needed. On my way out, I stopped for a few of my own prayers at the chapel of Our Lady of Soledad. She is my favorite image of Mary. Typically she is dressed by the community in a long fabric gown or dark cloak. And she is so very sad. In processions, she will follow the body of Christ. 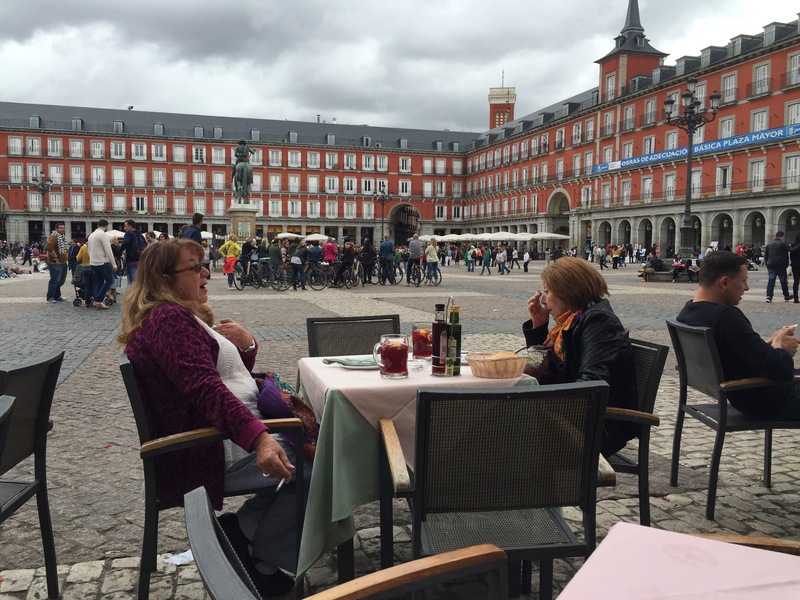 Then, lunch in the Plaza Mayor! Today’s entertainment? A full circus troupe of tumbling gymnasts worked in and around the Segway tours, the African street vendors, the gypsies on the side streets with their sprigs of Rosemary, and some political protest with two women handing out fliers. I love your description of your favourite church. I totally agree with you about candles – they MUST be real ones!